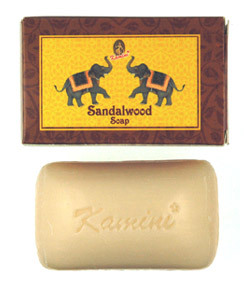 Kamini Sandalwood Soap - 100gr. I have been using this soap for over a year and I love it!! The fragrance is just right, not heavy like alot of soaps. I won't use any other kind of soap. This soap has a marvelous fragrance that seems to last just the right amount of time. It isn't over-powered by certain lotions. I've noticed that it has a wonderful amount of suds and feels almost silky.